← Vine … it’s all about cats right? What the heck is Facebook playing at now?! If you have been following my blog and also my charity blog, www.hopeforstrays.com, you will now that my cat has a Facebook page. You may also have read about what a huge support these pet Facebook pages can be to people, including vulnerable or sick people in need of support. If you follow my cat Don you will also now what a difference his account has made in raising awareness of animal cruelty issues and charity fundraising – Hope for Romanian Strays could never have raised over €1000 at our last auction without all the support from the “cats”. You can then imagine my horror when a couple of days ago I started hearing rumours that Facebook was doing yet another purge of pet profiles. 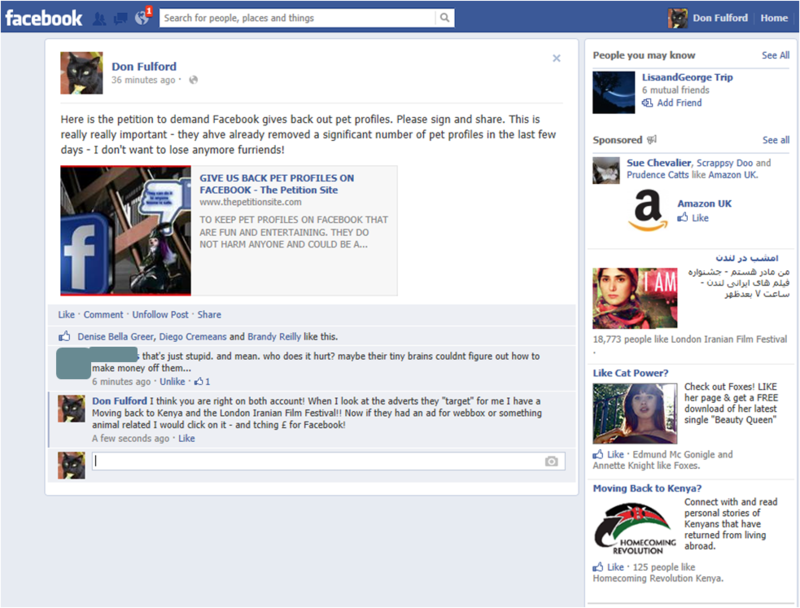 This has happened before – apparently because they are deemed “fake” profiles – but fortunately it never turned into a fully blown issue. This time however to everyone’s horror it is really happening. Through my cat’s Facebook page I have made some amazing connections and formed genuine friendships. My cat’s page has also enabled me to join health related support groups where I may want to remain anonymous. 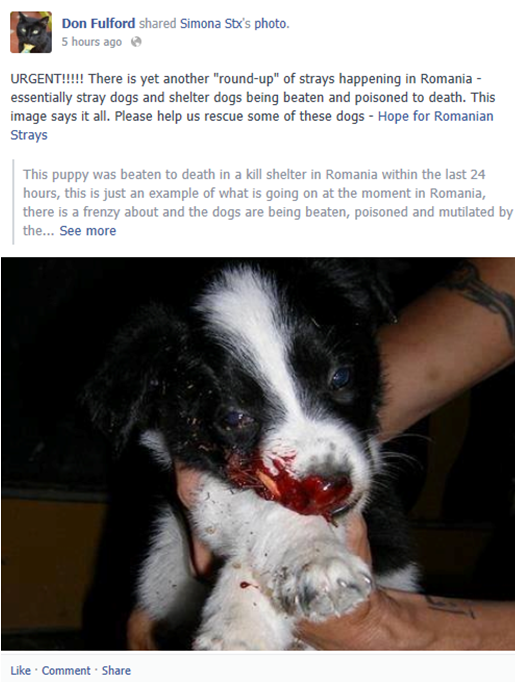 The other real tragedy of what Facebook is doing however is how much charity work and awareness raising goes on using pet profiles, and Don’s page is integral to the work I do for Hope for Romanian Strays. In fact I rarely use my personal profile anymore, but do most of my Facebooking through Don’s page – I get more interaction and more value from my cat’s page than from my own. I know I am not alone in this. Many of my “cat” friends also now rarely use their “human” accounts and have defaulted to using their pet accounts. There are many reasons why this happens, but I know of at least a couple that feel they have to have a personal account for family and old friends, but they do not want to share and interact with these people in the same way they do with their more genuine, and caring, friends they have met through their cat profiles. I for one do not want to mix my personal and my cat friends – they are two very different groups and I have two very different objectives for using my Facebook profiles. I discuss things with my cat friends that I do not want to share with some of my business friends who I have on my personal page. With this in mind you may then understand the anguish, horror, and huge amounts of anger, as we have now started to see some of our dearest friends being removed from Facebook simply because their profile was based around a cat and not them in person. A few have been turned into pages – but you cannot participate in a support group as a page, you cannot engage in the same way with you close friends as a page. We have all invested a lot of energy, love and joy into our profiles and having them removed is heartbreaking. Today I lost one of my closest friends, Tiggi, thanks to Facebook’s purge. I have no idea now how to contact Tiggi other than to send her a physical letter. I am also really worried about a couple of vulnerable people who are in very bad and difficult periods of their lives, and who need our support to help them cope. They have no similar support system offline, one of them does not want to use her personal page because she does not want her local friends to find out, and without their cat’s Facebook pages they will be cut off, left to deal with severe depression and potential suicidal thoughts, alone. 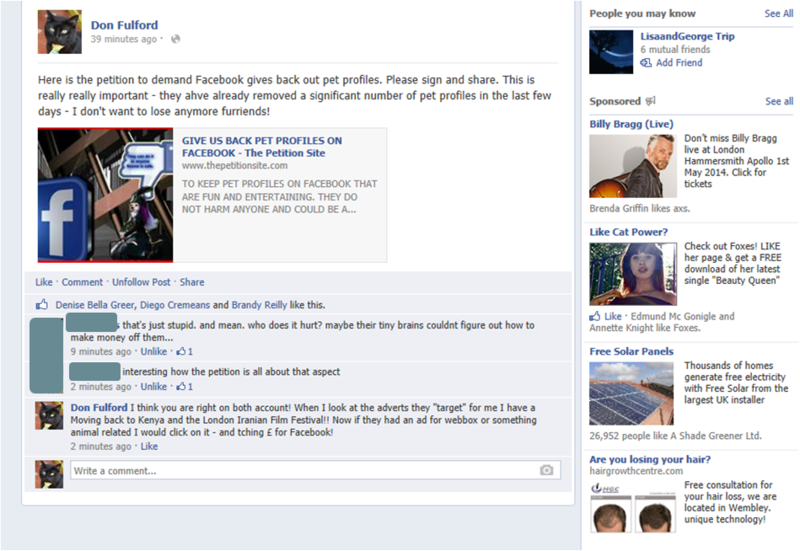 I understand Facebook’s desire to remove spam accounts but pet profiles are not spam. These are genuine accounts, being used for genuine friendship and engagement, and legitimate activities. If Facebook just offered us the option of a “pet” tick box they could easily segregate the genuine “pets” from the spam. They would also be far better able to target their advertising – which potentially would be a huge financial gain for them. Currently Don tends to get male or location related adverts which are totally inappropriate and un-interesting. The odd time however he does get animal or pet related adverts I have a far higher click through rate, and it has led me to purchase items too. Having asked other pet profiles I know I am not alone on this. For a listed company always needing to be aware of revenue generation this seems like a blatant missed opportunity for a steady revenue stream. We are now flocking to other social media platforms in droves. I can assure you that if Don’s profile goes I will leave Facebook for good. There are more than enough other platforms that welcome me, and my revenue. So here is some questions for Facebook. Why are you doing this witch hunt and attacking legitimate users? Why are cutting off such a potentially lucrative revenue stream? And why are you driving us away and forcing us to use competitor platforms? But most importantly why are you risking people’s health, possibly even lives, through this action and limiting legitimate, and much needed charity activity in this space? Have you really thought through the damage this witch hunt is causing Facebook both in terms of lost revenue potential but also in terms of image? 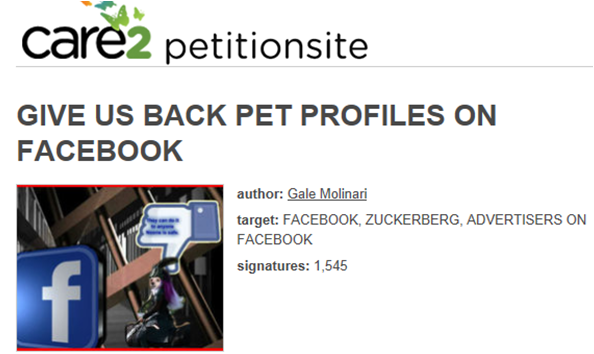 I sincerely hope Facebook reconsiders this witch hunt and re-instates our profiles, and in fact takes it a step further and finally acknowledges the huge pet community on Facebook and allows us to finally flag our pet pages and provide us services that meet our needs – which incidentally I suspect many of us would gladly pay for. In the meantime, just in case Don does get removed, you can find me over on www.furiends.com which seems to want my custom. Addendum: To give you an idea of the missed advertising take a look at these screen shots of the adverts “targetted” at Don’s profile! Posted on Sep 7, 2013, in Facebook, Social Media. Bookmark the permalink. 5 Comments. Thank you. Yes it is crazy – they are always going on about having to make revenue but are missing some glaring opportunities. Clearly not the brightest business folks over at Facebook. If I lose my cat page, I will have to do everything from my HUMAN’S page. And honestly, it is not that I don’t want my cat friends interacting on my human page, it is that I don’t want to subject my wonderful cat friends to the stodgey idiots on my human’s page! I worked very hard over the years to keep that seperate! If this comes down, I will off the humans from my human account and just opperate from there. I refuse to give up some of the best friends I have ever made in my life just because of some idiot who thinks they can make more money if they off all of the pet accounts! Wait til I get done writing to all of the places we spend money on cat food! This is a large household of kitties. And we spend several hundred dollars a month on expensive cat food, ALL BOUGHT ON LINE. ALL PLACES I FIRST HEARD FROM ON FACEBOOK. Lets see what happens when they are told we will boycott any and all advertising done on fb until the accounts are all restored. What you say totally resonates with me! I would actually love to hear from Facebook and the person who’s bright idea this was – what was their thinking? Are they deliberately trying to cut revenue and engaged users? This is actually something I didn’t mention but is also a huge plus about cat pages – we really engage! We engage with each other but also with brands and advertisers. Surely these are exactly the kind of users Facebook should be encouraging not culling? !